Funded and commissioned by Sheffield City Council and run by the Mercia Learning Trust, this new-build Secondary and Sixth Form School has opened its doors to students and the wider community in Sheffield. Capable of taking on 900 Secondary School students with an additional 300 Sixth Form students, this project represents a big step forward for Sheffield City Council. It marks another advancement in their programme of educational works created to ensure the provision of Secondary-level education for the significantly large number of children currently coming through the city’s network of Primary schools. This school provides parents and students with a real educational choice within the South West area of Sheffield. 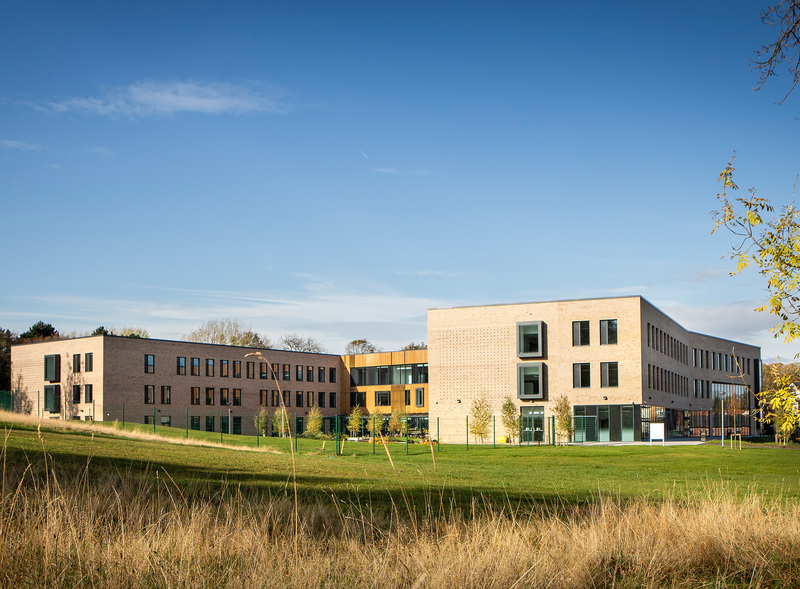 The School’s design is distinctive and striking, applying clever use of external brick and timber that helps the building sit harmoniously within the immediate landscape’s natural palette of colours. Wherever possible, this design has been inspired and driven artistically by the open green spaces surrounding it and the buildings of the surrounding residential area. Throughout the building itself, the use of renewable technology and sustainable design principles such as renewable energy PVs and green roofs further cements this built form into the natural setting. These features, along with other features such as the use of natural daylighting achieved via the large windows and rooflights, have guided the School to achieve a BREEAM ‘Very Good’ rating. The building utilises the natural contours of the site to create a lifted sports hall and also conservatively works with existing features on the site, such as the car parking facilities and access junction. Exceeding a challenging brief, this building maximises the value of its serene setting by integrating sensitively into the open space – presenting a visually welcoming image of the School to both the attending students and the wider community. The design of the building achieves a preservation of the open nature surrounding it through the use of the finger design and the open courtyard, promoting an aesthetic assimilation into the parkland setting. The School’s specialism of performing art spaces are linked by a central atrium area that also facilitates community access and even provides a ‘family’ dining area at the heart of the building. By preserving the open nature of the parkland setting and views of the tree-lined horizon, the community access to the wider site is maintained. Community integration has been key to the success of this project, with the curtain walling and large, glazed elevation creating a unique and open frontage to the School’s main entrance and community facilities. Alongside the open and encouraging design principles, the School also features separate sports facilities open to the community, with an accessible route being included from the changing facilities to the pitches. The Mercia School is a building that truly benefits from the surrounding area, choosing to sit in synchronisation with its surroundings, offering a welcoming and familiar feel for those around and in it – students, staff and community members alike.